While out walking on the streets of Harajuku, we met 18-year-old Kana, whose cool hairstyle and all-black fashion caught our eye. Sporting long hair with blunt bangs, Kana is dressed in a black blazer, worn over a mock-neck sheer top and layered with an asymmetrical ombre pleated dress, all of which are from popular Japanese streetwear designer, Yohji Yamamoto. 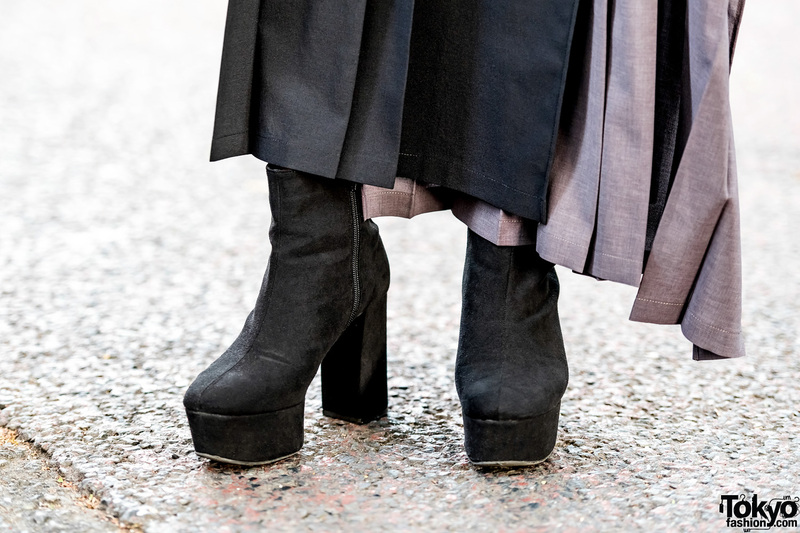 A pair of suede platform booties, and a bold pop of red lipstick rounded out Kana’s minimalist street style. Yohji Yamamoto is Kana’s favorite fashion label, and she likes the music of Japanese rock band, [Alexandros]. For more on Kana, follow her on Instagram.